Maskbook is an international, participatory and artistic project by the association Art of Change 21. Launched in 2015 on the occasion of COP21, Maskbook aims to raise public awareness on air pollution and climate change. With Maskbook, the anti-pollution mask is a symbol of pollution, a means of action and a canvas for creation. The anxiety-provoking image of the anti-pollution mask is transformed into an expression of optimism and commitment to the planet. 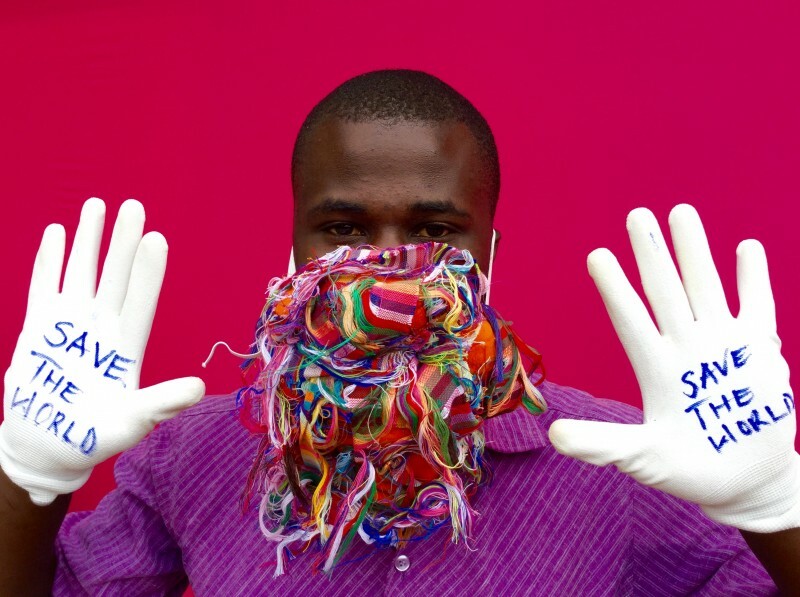 Antony Memba and his mask "Save the World." Maskbook is truly a collective and engaged work of art, made up of masked portraits from around the world. The portrait gallery on maskbook.org already has more than 2,500 masked portraits of participants from over 40 countries around the world. Each mask is a personal creation, made from recycled materials or made digitally. Each mask-creation is unique because it communicates its creator’s message in the face of the environmental crisis. Collective art-action project, Maskbook works both offline, online, and around the world through an international program of workshops and exhibitions as well as through a mobile app. Maskbook Exhibition and Workshop at Daegu Photo Biennale in South Korea. The Maskbook workshop not only provides the opportunity to practice the circular economy firsthand, but also, more globally, to offers a chance to take a first step for the environment, through committed creativity. 80% of Maskbook participants say they are more optimistic about citizens' ability to solve the environmental crisis. 70% of respondents said that Maskbook had favorably influenced their behavior in regards to the environment and favored, in one way or another, an "ecogest". Maskbook is a universal project, inclusive and accessible to all. The mask exists in all countries and resonates in all cultures around the world: from Paris to the Kangemi slum in Nairobi, from the boats of the nomadic Badjaos of Borneo to the city-dwellers of Shanghai, from Pokhora, Nepal to Quito, Ecuador, the Maskbook experience allows each participant to speak their truth and to rediscover the pleasure of creating with one’s own hands. Workshop in Bengaluru, India with Jagriti Yatra. Maskbook relies on a global network of partners in the fields of the environment, education, and art, as well as the Masktivist network, a growing, international community of Maskbook workshop organizers. Mask-Trotter, the new, more mobile Maskbook initiative with an extra human touch, launched in 2017, is gaining steam in 2018. Mask-Trotter is a project that renders the Maskbook project even more nomadic and inclusive. Globetrotters and adventurers, en route to remote locations, propose individual Maskbook workshops to locals they meet along the way. These Maskbook encounters promote an intercultural dialogue on climate change and air pollution. With the Mask-Trotter initiative, Maskbook also aspires to develop numerous collaborations with the native peoples, and is already collaborating with the famous photographer Pierre de Vallombreuse, patron of Mask-Trotter. Supported since 2016 by the UN Environment (United Nations Environment Program) and since 2015 by the Schneider Electric Foundation, Maskbook has been labeled COP21 and COP22 and is sponsored by the French Ministry of Culture. Individually, collectively, via special events or during your travels, there are many ways to participate in Maskbook! At the workshop at We Love Green eco-music festival in Paris, France. Join the world's leading environmentalists, artists and committed citizens in the Maskbook portrait gallery. All you have to do is make a mask creatively and ecologically, with your own hands, using recycled waste or even via digital creation. Then take a picture of yourself wearing the mask! 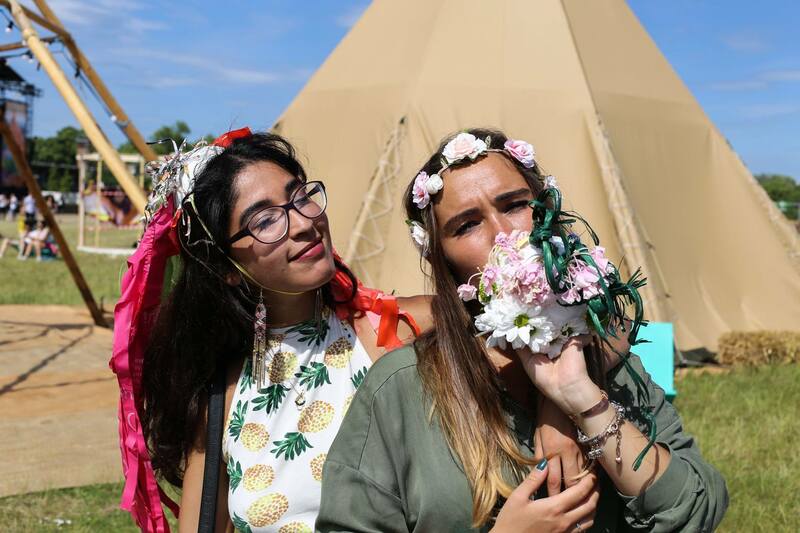 Share this fun and communal moment that allows everyone to get involved in the fight to protect our environment and explore the link between art and sustainable development using DIY and creativity. A Maskbook workshop is easily adapted to many different settings and the ingredients are easy to find: they are your waste! Look here for more information. Third step: Become a Partner, Join our Team, or Bring your Financial Support! The adventure has only just begun! Follow our news, our agenda and most of all, get involved! Maskbook was born during the Conclave of Art of Change 21, an international meeting of eco-creation, that took place at the Gaîté Lyrique in Paris in 2014, just ahead of the COP21. This Conclave brought together 21 artists, social entrepreneurs and youth involved in the ecological transition. Wen Fang still plays a major role in the project: she regularly hosts Maskbook workshops throughout Asia. Wen Fang and her mask "Spark." Art of Change 21 is a one-of-a-kind association that brings together artists, social entrepreneurs and young leaders who are deeply committed to sustainability and the environment, in order to create original, impactful solutions that address climate change and promote sustainable lifestyles. Art of Change 21 started its activities in 2014 ahead of COP21, with the “Conclave” - an international event of co-creation that brought together artists, social entrepreneurs and leaders of the ecological transition from all over the world. Together they decided on two concrete actions to mobilize the public for the environment, and so the “Maskbook” and “Caire Game” projects were born. Today these two projects operate on a global scale, reaching out to over 10,000 people since their inception. More than 60 events have been organized worldwide under the umbrella of these 2 projects, in France, China, Kenya, Ecuador and South Korea, to name a few. The second edition of the Conclave is scheduled for October 2017 and will aim to design the next project that will be implemented by the association. The association is an active civil society partner of the UNFCCC. Previously, Art of Change 21 participated at the COP21 (held in Paris in 2015), the COP22 (held in Morocco in 2016), and the COP23 (in Bonn, Germany). Art of Change 21 is a not-for-profit association, created in 2014 and registered in France. It is supported by UN Environment and its main partner is the Schneider Electric Foundation. Its patrons are artist Olafur Eliasson and social entrepreneur Tristan Lecomte.